there is never a dull moment for ghf staff and family, and last week i threw all of them a curveball when in my wonderful klutziness i tripped on a rock up in the woods and broke my right arm. as i return upstairs to bed, all i can do is thank god the cats don’t care about the nfl and they still think i have the most important broken arm in their lives. This ancient grandmother of all Roses has been calling nonstop, asking me to bring her to your attention as a deeply supportive Flower Essence friend for this tumultuous time. Please avail yourself of this Flower Essence! It wants to support you to feel safe, strong and able to go on. It offers a profound vibration of encouragement much as a beloved grandmother would- and in fact, this Rose IS the grandmother of almost every Rose you know. Why is Old Blush China Rose the grandmother of most modern Roses? In the wild, Roses freely cross pollinate to create new Roses. In the 1700’s, cross pollinating Roses to create new Roses became a focus of gardeners as well. 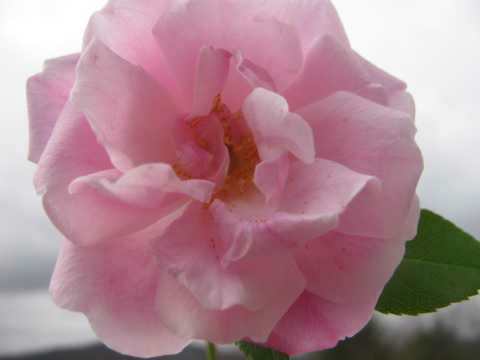 Old Blush China Rose was a key player in all intentional breeding because she is what is known as a repeat bloomer. Discovered by western horticulturists in China in the early 1700’s, Old Blush was the first Rose imported to the west that had this quality of repeat blooming. Until the discovery of Old Blush, all Roses in cultivation in the west would bloom only for a few short weeks in early summer, and that was the end of their flowering for the year. But Old Blush China Rose bloomed almost nonstop from early summer to late fall. In my greenhouse today, my pot of Old Blush China Rose is blooming away and no doubt those outside in southern gardens are also going strong. Old Blush asked me to pluck this blossom from the greenhouse and photograph it for you. Dark skies, snow flurries, a chilly greenhouse and this Rose goes on blooming. An extended bloom time or repeat bloom time was an extremely exciting genetic trait to folks like Linnaeus who received a cutting of this rose in 1752. Linnaeus, the father of modern taxonomy, began the process of organizing latin names for all creation, but even as a child, he had a special love for Flowers. He found them very calming when he was upset, and his parents knew to give him Flowers when they wanted to comfort him. How lovely that a friend who had traveled to China as the ship physician brought Linnaeus back this slip of calming, centering, strengthening Old Blush China Rose. Once this reblooming strength of Old Blush China Rose was understood by Rose breeders, Old Blush became one of the parent Roses used in almost all new Rose creations. From its children were created more crosses, most all of them attempts to keep Old Blush’s trait of repeat blossoming. In this way Old Blush became the mother, grandmother, great grandmother etc of all modern hybrids. Why Old Blush China Rose right now? This is certainly something I have been asking Old Blush- She has literally JUMPED OFF the shelves to call out to me in the last few days, and I felt that there was more I could understand about this Rose to explain why she is so determined to get out there to you right now. In my effort to learn more, I read a series of essays in which famous gardeners of the modern era write about their favorite Rose. A number of them write with great affection about Old Blush China Rose, and several pick Old Blush as their favorite. There are plenty of repeat blooming Roses now so that doesn’t explain why people who have spent a lifetime working with Roses would choose it as their favorite. It really must be something to do with the essential wisdom and power of this incomparable Rose. In one essay, a gardener who chose Old Blush as his favorite tells the reader how throughout his life he has found this Rose in the most unlikely, inhospitable places, flourishing without good soil or water or any attention. He has found it in abandoned gardens, by the foundations of long gone houses, at dusty neglected highway intersections and in old graveyards. In each place, Old Blush was throwing off sprays of Flowers, unperturbed by the challenges it faced. Reading this description was a lightbulb moment for me. I first met Old Blush in an ancient garden in Bermuda and later got myself a bush to grow in the gardens in the summer and keep in the greenhouse in the dead of winter. I know her as a friend that blossoms like the energizer bunny and that gives us an Essence that makes me feel more sturdy. But in this man’s description, I discovered another layer of her strength. Old Blush is a survivor. She goes way back, yet she continues on as fresh as the day she was created. She wants to help us not only endure but flourish as she does. She wants to show us we can do this even in extremely trying circumstances. Hers is not an offering of good intentions alone but a real grounded wisdom of survival with gusto and delight. As our hearts go out to our many Green Hope Farm friends affected by Sandy, we wish we could get a box of Essences to each of you. Even Green Hope Farm, so far from the center of the Sandy, has had spotty phone service and internet since the storm so I don’t have any confidence that those closer to the coast can read this right now, but if you can, please know we are thinking of you. This morning we tried to think of the most helpful Flower Essences for those of you affected by Sandy. First we have a special Emergency Care mix we created when Hurricane Katrina occurred. We were lucky enough to have a triage center in Selma, Alabama that distributed this mix. This mix was then ready for the people in Japan after the earthquake and tsunami, and then it went off to many folks a year ago when Hurricane Irene came through. Ironically, one of the people who saw to the distribution of at least a thousand bottles of this Flower Essence mix in Japan is right in the thick of things near the lower Hudson River in New Jersey- We are thinking of you Tomoyo and hoping you still have some of the Emergency Care for Japan to use and share! So today as we consider what Flower Essences we wish all the people and animals affected by Sandy had in their hands, I think first of this Special Emergency Care mix which we still have available. Emergency Care or Animal Emergency Care are also wonderful so if you have either of those on hand, use them. The Special mix is not that different in its purposes. All three mixes offer a lot of support to overwrought electrical systems. Our Anxiety combination mix would certainly be another top choice for animals and people. This event is simply too much to process and Anxiety helps free us from this task and ease our burdens in so many ways. Grief & Loss is another combination mix I would include as a top choice. This tender mix comforts and consoles even amidst the big griefs of losing beloved places, the homes and neighborhoods of our lives. Ireland is a watery place and Irish Essences have been calling to people this week in a big way. There is something very steadying about these Irish Flower Essences, ancient and also holding a confident long view, one forged from navigating beyond many, many previous watery events. Omey Island would be my first choice from the Irish collection. This one is all about helping us when our life circumstances are constrained by forces beyond our control. Omey Island is a tidal island cut off from the mainland four hours in every twelve. This is a small tidbit of how Omey describes herself at the beginning of the Irish Collection section of the website. Golden Armor also feels essential. This one helps animals and people feel cocooned from swirling events. It literally buffers out dissonance but also helps us keep our electrical field strong. It has anti viral and anti bacterial Essences in it that are important for those of you dealing with toxic flood waters as well as those run down by the emotional exhaustion of the situation. I can’t speak too highly of this one. We have seen a lot of Sanctuary flow out the door here since its creation this summer. It is a great mix for helping us feel safe and secure even when all the externals have changed or we have gone through a traumatic experience that leaves us raw and vulnerable. Special Emergency Care, Anxiety, Grief & Loss, Omey Island, Golden Armor and Sanctuary. This group of Flower Essences serves on so many levels. I am grateful to have them ready right now for people and animals. I could go with more suggestions and of course we are happy to talk on the phone or on email with you to help you chose Essences dovetailed to your specific situation- but this group feels helpful for the immediate aftermath. Later Recovery mix and Phoenix Rising will have their role to play and many others, but this is a group that addresses the immediate circumstance and offers a lot of support.